The South African Government has signed up to the WHO resolution that integrates palliative care into the continuum of care for patients in the health system. This will have an impact on health professionals in South Africa. 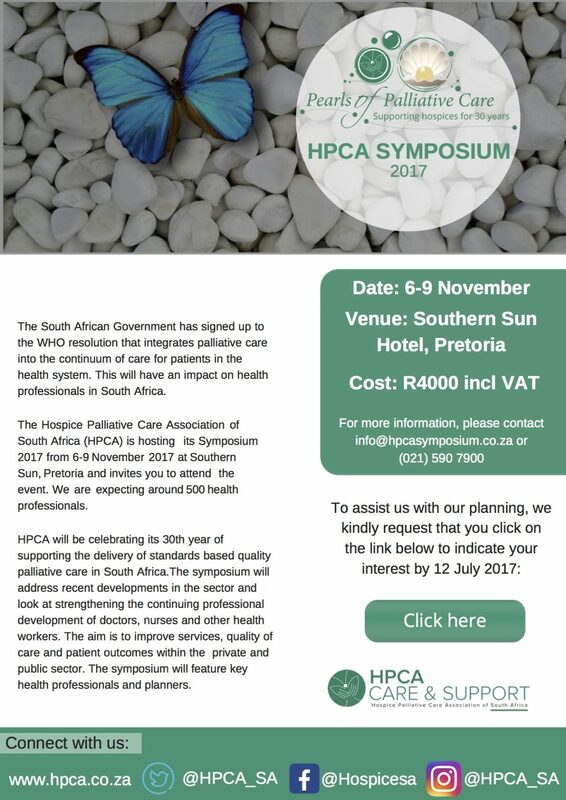 The Hospice Palliative Care Association of South Africa (HPCA) is hosting its Symposium 2017 from 6-9 November 2017 at Southern Sun, Pretoria and invites you to attend the event. We are expecting around 500 health professionals. HPCA will be celebrating its 30th year of supporting the delivery of standards-based quality palliative care in South Africa. The symposium will address recent developments in the sector and look at strengthening continuing professional development of doctors, nurses and other health workers. The aim is to improve services, quality of care and patient outcomes within the private and public sector. The symposium which will feature key health professionals and planners. The cost for those attending is R4000 VAT inclusive.